Basin Production & Completion Tools is built on the strong foundation of the company known as FHE. Frank Henry Equipment or FHE continues to this day operating out of Grand Junction, Colorado and San Antonio Texas. FHE USA LLC supports wireline service companies by manufacturing top-quality tools and equipment. The heritage of this industry has bred our work ethic and dogged determination. We pack these values into each product and relationship. FHE delivers superior tools and equipment that help your team succeed in the field. 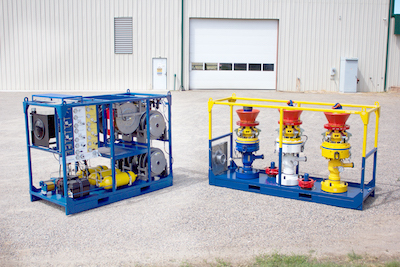 With the fastest turn around times in the industry, we will get your quality, customized wireline pressure control equipment to you quickly, limiting downtime and improving productivity. CUSTOMER SERVICE: Your team's success is our #1 goal. Let our knowledgeable staff help you succeed in the field. QUICK DELIVERY: Fastest deliver times in the industry for high-quality tools and equipment. DURABLE AND RELIABLE EQUIPMENT: Built to perform in the harsh wireline environments. HARD WORK AND INNOVATION: Continuing the values that have historically made our industry great.